Universal Acceleration (UA) is a theory of gravity in the Flat Earth Model. UA asserts that the Earth is accelerating 'upward' at a constant rate of 9.8m/s^2. This produces the effect commonly referred to as "gravity". 3.2 Why doesn't the Earth's velocity reach the speed of light? According to Flat Earth Theory, gravity is not the main force keeping us on the ground. Instead, there is a force that produces identical effects as observed from the surface of the earth. This force is known as "Universal Acceleration" (abbreviated as UA). Objects on the earth's surface have weight because all sufficiently massive celestial bodies are accelerating upward at the rate of 9.8 m/s^2. The mass of the earth is thought to shield the objects atop it from the direct force of UA. Alternatively, it is possible that the force of UA can actually pass through objects, but its effect on smaller bodies is negligible (similar to gravity in RET cosmology, which only has a noticeable affect on very large objects). However, not all Flat Earth models dismiss the theory of gravity. The Davis Model proposes that the earth is an infinite plane exerting a finite gravitational pull (g), which is consistent with Gauss's Law. The phenomenon we observe everyday when falling is currently substantiated in modern physics by what is called "The Equivalence Principle". 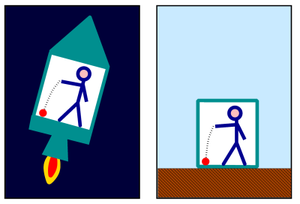 This principle in physics states that in a relative frame of reference, it is not possible to locally discern whether the frame is accelerating upwards, or if the object inside the frame is affected by gravity. Several frequently asked questions are, "How is that I can jump and then come back down?" and "Why is it that I feel as though I'm being pulled toward the earth?" Since the Earth is pushing you upwards, you are moving at the same speed as the Earth, much like when you are sitting in a car, the car is pushing you along. When you jump, your upward velocity is for a moment, greater than the Earth's so you rise above it. But after a few moments, the Earth's increasing velocity due to its acceleration eventually catches up. It is a common misconception that if we were to continuously accelerate over time, we would eventually be moving faster than the speed of light. This is of course, incorrect as nothing with mass may do so. According to the Special theory of Relativity, the Earth can accelerate forever without reaching or passing the speed of light. Relative to an observer on Earth, the Earth's acceleration will always be 1g. Relative to an inertial observer in the universe, however, the Earth's acceleration decreases as the its velocity approaches c. It all depends on our frame of reference to measure and explain the Earth's motion. Thus, despite what most people think, there is no absolute "speed" or velocity of the Earth. Special relativity (SR) (also known as the special theory of relativity or STR) is the physical theory of measurement in inertial frames of reference proposed in 1905 by Albert Einstein (after the considerable and independent contributions of Hendrik Lorentz, Henri Poincaré and others) in the paper "On the Electrodynamics of Moving Bodies". It generalizes Galileo's principle of relativity–that all uniform motion is relative, and that there is no absolute and well-defined state of rest (no privileged reference frames)–from mechanics to all the laws of physics, including both the laws of mechanics and of electrodynamics, whatever they may be. Special relativity incorporates the principle that the speed of light is the same for all inertial observers regardless of the state of motion of the source. This theory has a wide range of consequences which have been experimentally verified, including counter-intuitive ones such as length contraction, time dilation and relativity of simultaneity, contradicting the classical notion that the duration of the time interval between two events is equal for all observers. (On the other hand, it introduces the space-time interval, which is invariant.) Combined with other laws of physics, the two postulates of special relativity predict the equivalence of matter and energy, as expressed in the mass-energy equivalence formula E = mc2, where c is the speed of light in a vacuum. The predictions of special relativity agree well with Newtonian mechanics in their common realm of applicability, specifically in experiments in which all velocities are small compared to the speed of light. The theory is termed "special" because it applies the principle of relativity only to frames in uniform relative motion. Special relativity reveals that c is not just the velocity of a certain phenomenon, namely the propagation of electromagnetic radiation (light)—but rather a fundamental feature of the way space and time are unified as spacetime. A consequence of this is that it is impossible for any particle that has mass to be accelerated to the speed of light. Why doesn't the Earth's velocity reach the speed of light? where is called the Lorentz factor and c is the speed of light in a vacuum. As you can see, it is impossible for dark energy to accelerate the Earth past the speed of light. The are several explanations for UA. As it is difficult for proponents of Flat Earth Theory to obtain grant money for scientific research, it is nigh on impossible to determine which of these theories is correct. This model proposes that the disk of our Earth is lifted by dark energy, an unknown form of energy which, according to globularist physicists, makes up about 70% of the universe. The origin of this energy is unknown. This model states that there is an infinite plane of exotic matter somewhere below the disk, pushing in the opposite manner of traditional gravity. This is a recent theory, and is in progress. Q: Why does gravity vary with altitude? Q: If gravity does not exist, how does terminal velocity work? This page was last modified on 19 November 2018, at 09:04.